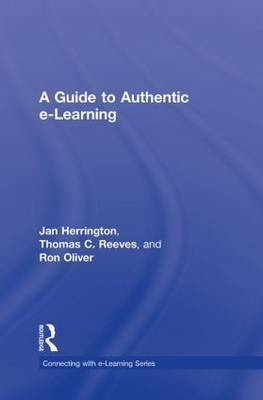 Part of the groundbreaking Connecting with e-Learning series, A Guide to Authentic e-Learning provides effective, working examples to engage learners with authentic tasks in online settings. As technology continues to open up possibilities for innovative and effective teaching and learning opportunities, students and teachers are no longer content to accept familiar classroom or lecture-based pedagogies that rely on information delivery and little else. Situated and constructivist theories advocate that learning is best achieved in circumstances resembling the real-life application of knowledge. While there are multiple learning design models that share similar foundations, authentic e-learning tasks go beyond process to become complex, sustained activities that draw on realistic situations to produce realistic outcomes. A Guide to Authentic e-Learning: develops the conceptual framework for authentic learning tasks in online environments provides practical guidance on design, implementation, and evaluation of authentic e-learning tasks includes case studies and examples of outcomes of using authentic e-learning tasks Written for teaching professionals in Higher Education who teach online, A Guide to Authentic e-Learning offers concrete guidelines and examples for developing and implementing authentic e-learning tasks in ways that challenge students to maximize their learning. 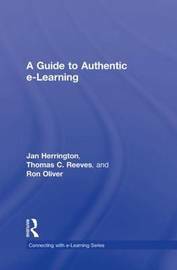 This essential book provides effective, working examples to engages learners with authentic tasks in online learning settings. Jan Herrington is a Professor in the School of Education at Murdoch University in Perth, Western Australia. Thomas C. Reeves is a Professor of Learning, Design, and Technology at The University of Georgia, USA. Ron Oliver is Pro-Vice-Chancellor (Teaching and Learning) at Edith Cowan University in Perth, Western Australia.